Pregnancy and comfort sleeping are two ideas that can be read in an alien’s magazine. Comfort sleeping during pregnancy is a wrestling match every lady experiences. If you are facing the problem, trust us, we do understand your agony. And although we don’t want to trouble you further, it’s better if you know beforehand that this worsens in the third trimester when the baby bump is full.Unfortunately, your regular sleeping position will not work for you in pregnancy. But don’t fret, we are here to guide you through some fantastic sleeping tips and suggested sleeping positions during pregnancy. Your gynaecologist might have advised you not to sleep on your stomach. Tender breasts and growing bump make sleeping on your stomach impossible. If it puts pressure on your womb, then, it is probably not a good sign for the baby, right? It is a known fact that the first and third trimesters of the pregnancy period are very important. However, you can carry on with all your routine work without having to worry about your baby. As long as you are leading a moderately active (and not hyperactive) lifestyle, eating your food right, staying positive and getting ample time for rejuvenation, your pregnancy days will be very smooth. However, it’s always advisable to listen to your doctor; she/he’s the one who knows the health of your baby and womb. Does Less Sleep Harm My Baby? No, it doesn’t. Since sleep problems are quite common in this period, it wouldn’t have any impact on your baby’s growth. However, lack of sleep or lack of rest may cause health problems. Always listen to your body, if it feels tired, just rest or slow down. The best sleep position to follow during pregnancy is SOS (sleep on side). Lying on your side will ease the blood circulation to your womb and around your body. However, it is suggested to sleep on your left. Sleeping on the left side will increase the flow of nutrients and blood to the placenta. Left side sleeping would also prevent the growing uterus put pressure on your liver and allow the fetus to get enough oxygen. It furthermore reduces the energy spent in drawing blood for mom and baby. You can alternate your sleeping position from left to right anytime. However, make sure that you don’t sleep on your right side for too long. If you experience back pain, you can place a thin pillow under your abdomen for support as it helps in the later stages of pregnancy. In the 3rd trimester, you may experience shortness of breath. To overcome this, you an prop two to three pillows, raise your head a bit and sleep. You can bend your knees and relax for a comfortable sleep during pregnancy. You can try placing a pillow between your knees for additional support. If you are suffering from heartburn, you can elevate your head a bit and sleep to prevent stomach acid from rushing up. If you experience hip pain from sleeping on one side, use a firm mattress. Try using egg-crate foam mattress for complete torso support. In the first two-three months of pregnancy, you can relax on your back with no worries. However, as said earlier avoid this as you graduate. However, resting on your back in half sitting position with a couple of pillows propped up behind for support is recommended. It is good for moms who suffer from lousy chest burns. Also, the first trimester, when most of the pregnancy nuisances are less, is the right time to get used to sleeping on your sides. It is also essential to plan your sleep. Taking naps whenever possible is a great way to retain energy. The best time for napping during pregnancy is between 2 PM and 4 PM.It is also advised not to consume excessive fluids after 6 PM. Previous articlePlanning Babies After 35? Here is What You Must Know! 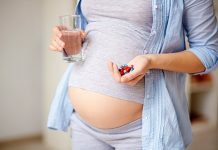 Next articleAlprazolam Or Xanax During Pregnancy! How Safe Is It?